Aethelred II (Ethelred) was the son of Eadgar, succeeded his brother, Edward the Martyr, in 979, and, for his want of vigour and capacity, was surnamed the Unready. He paid a tribute to the Danes, raised by a tax called Danegelt, levied on his subjects. To free himself from this oppression, he caused all the Danes in England to be treacherously massacred in one day (Nov.13, 1002). 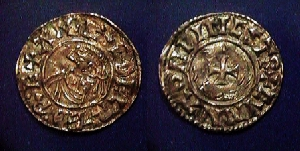 On this Sweyn, king of Denmark, invaded his kingdom and compelled him to fly to Normandy, but Sweyn dying soon after, Ethelred returned and resumed the government. He died in 1016, while Cnut was preparing his great expedition.